Black Friday has a reputation of being the biggest shopping day of the year in America. But over the years, the holiday has grown substantially around the world — especially in Europe. 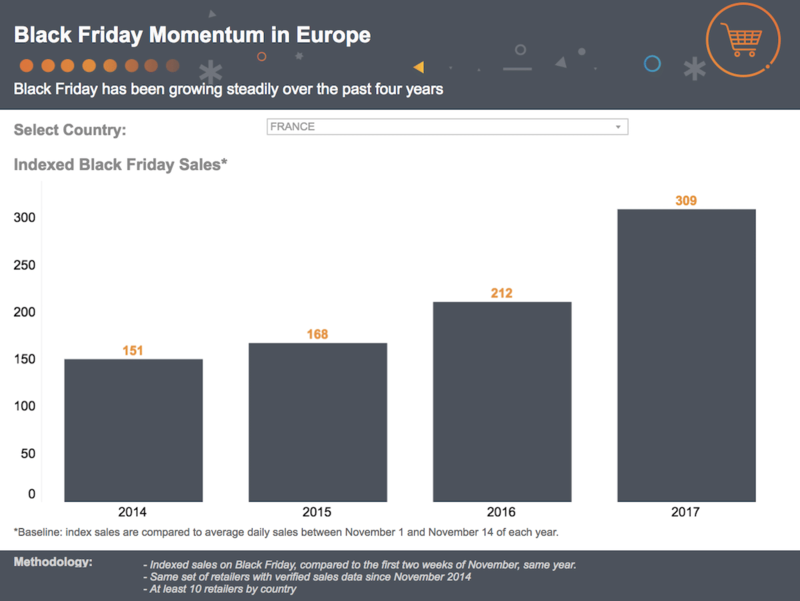 To better understand Black Friday in Europe, we decided to dive into Criteo data to look at the past four years of Black Friday shopping across the pond. Specifically, we analyzed how Black Friday sales spikes have increased significantly since 2014. 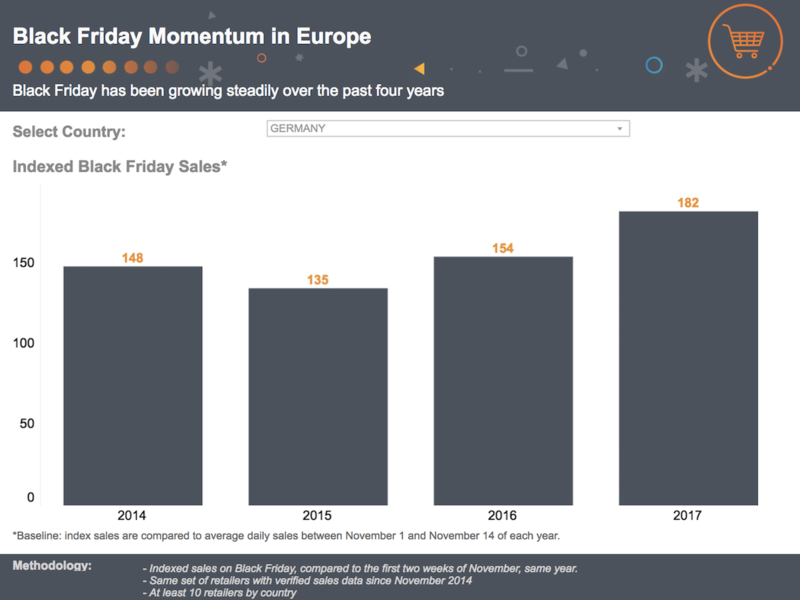 Our Black Friday Dashboard reveals just how much shoppers in Europe are embracing the shopping extravaganza. The dashboard features data on 11 European countries — Austria, Belgium, Denmark, France, Germany, Italy, Netherlands, Spain, Sweden, Switzerland, and the United Kingdom. The charts show indexed retail sales for each year, from 2014 to 2017, compared to the average daily sales between November 1 and November 14 of that year. In many cases, the findings are nothing short of amazing. 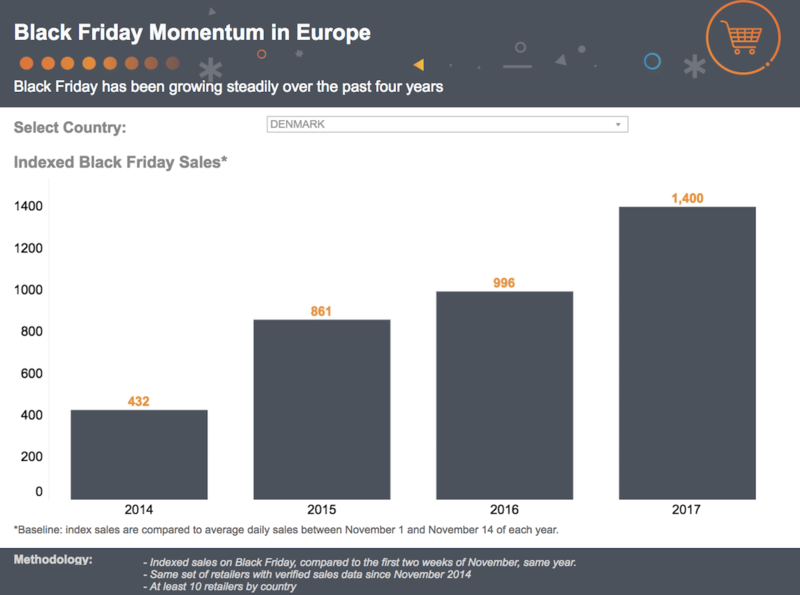 In four short years, Black Friday in Europe has gone from an obscure shopping holiday to one of the best retail days of the year. Denmark saw an astonishing +1300% sales compared to the first weeks of November in 2017. Four years earlier, for the same subset of retailers, it was only +332%. Compared to early November, retail sales in France shot up by over 200% on Black Friday last year, doubling what we saw in 2016. In the United Kingdom, Festive Season sales around Black Friday have shown steady growth since 2014. Compared to the first two weeks of November, retail sales in the UK were up by over 60% on Black Friday 2017. 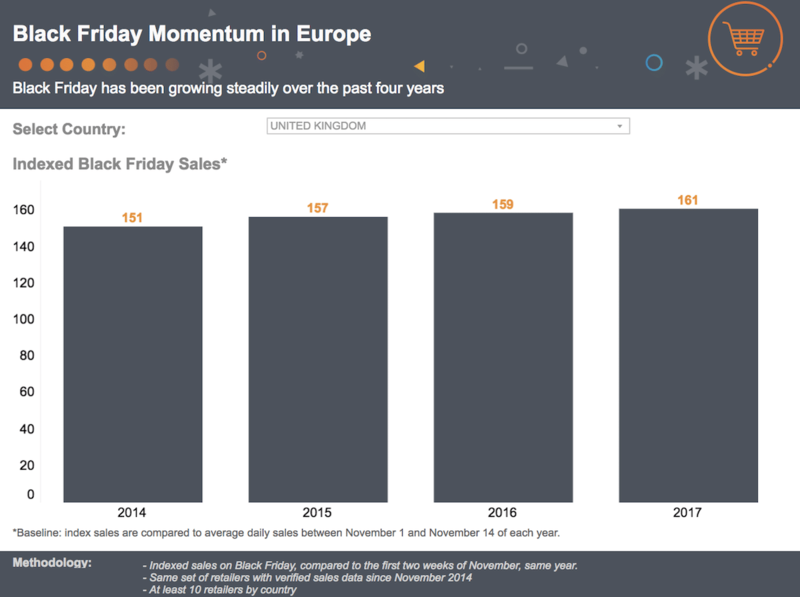 To see insights on many more countries in EMEA, check out the Black Friday Momentum in Europe Dashboard, and be sure to stop by the Criteo Seasonal Sales Dashboard for data on mobile share, site traffic, and more. For the full rundown on how to prepare your marketing campaigns from now through 2019, download our Festive Season Report.